Description Perform arithmetic operations using one or two volumes at high speed. Volume Maths (Simple) performs arithmetic operations using one or two volumes at high speed. To evaluate complex expressions, including trigonometric functions and logical comparisons, use the Volume Maths process (see Volume Maths). A formula describing the result is updated as parameters are changed. Select Volume Maths (Simple) and type a name. At Volume 1, select your first input volume. None (blank): Allows scaling the input volume by a constant multiplier, and/or shifting the sample values by a constant shift. If using the default scale of 1 and shift of 0, it performs a fast identity operation that might be useful in a workflow to give the volume a "name" at a particular step of the workflow. + volume: Sums the sample values of the two volumes at each trace location. 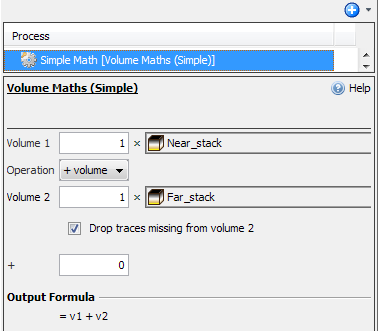 − volume: Subtracts the sample values of one volume from the other at each trace location, for example when extracting a noise model by removing a process output from its input. × volume: Multiplies the sample values of two volumes together at each trace location, for example if applying a gain scalar volume to a second volume. ÷ volume: Divides the sample values of one volume by the other at each trace location, for example if backing of a gain. ÷ value: Divides each sample value of the input volume by a constant, which may be more accurate than scaling the volume by 0.3333. If you have selected an operation that requires another volume, select the second volume at Volume 2. If the Drop traces missing from volume # box is checked, then the output will contain only traces that exist in both input volumes. If unchecked, then any traces that exist in volume 1 (the output of the previous process, if in a workflow) that do not have a corresponding trace in the other volume will be unmodified in the output. The output of this process will never contain a trace in any location where there is no trace in volume 1 (the output of the previous process, if in a workflow) - you will need to use the Volume Maths process if this is required. If the sample value of both input volumes is NaN, then the output will be NaN. If at least one volume has a non-NaN value for a sample, then the NaN will be treated like a value of 0.